[Press Release] Export Saint Lucia (TEPA) is making strides towards strengthening ties with the Department of Agriculture. In May of this year, the Agency and the Department of Agriculture, signed an MOU agreement that would see greater collaboration between the two entities. 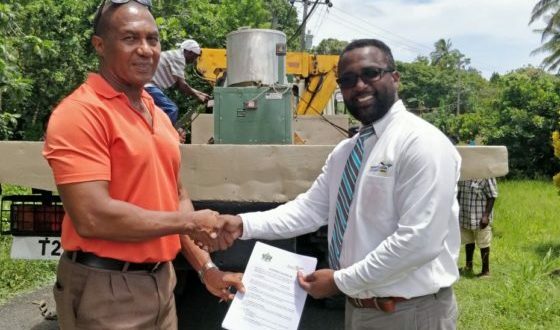 Export Saint Lucia (TEPA) on Tuesday September 18, 2018 made the donation of two pieces of equipment to the Department of Agriculture in Vigier Vieux Fort, one being a Cassava Press and the other a Cassava Grinder, to be used at the department’s agro processing facility at Anse-Ger, Desruisseaux. Export Saint Lucia (TEPA) previously donated the equipment to the Vigier group to be used for the production of cassava byproduct; however the group was subsequently disbanded. In spite of this, Export Saint Lucia (TEPA) thought of a more apt way to achieve the mandate of crop diversification and increased agro processing on island, all while strengthening ties with the Department of Agriculture. The equipment was donated to the Department of Agriculture for its intended use at the Anse-Ger agro-processing facility, to better assist the cottage industry workers in the community with the production of cassava by-product, as well as to have a significant impact on the coconut by-product farine making process. According to the Special Projects Coordinator for the Department of Agriculture Mr. Eden Compton, the procurement of the Cassava Grinder and the Cassava Press will go a long way in the department’s efforts in increasing capacity when it comes to both cassava production and product diversification. This he says also speaks directly to the mandate of the MOU with Export Saint Lucia (TEPA), when it comes to raising the awareness of business opportunities, partnerships and joint ventures in an effort to increase regional and international trade of agricultural produce. “We have groups like the Saint Lucia Network of Rural producers, The Babonneau Cluster also the Micoud Cluster. They could utilize it because they’re involved in processing cassava. So it would be a matter of repairing the two pieces of equipment, so that they can be utilized by other groups”. Another positive according to Compton is the direct economic impact that will be felt in the Anse-Ger community. Officials indicate that collaboration will continue between the two entities in an effort to strengthen the capabilities of targeted groups.